This image of the debris of an exploded star — known as supernova remnant 1E 0102.2-7219, or "E0102" for short — features data from NASA's Chandra X-ray Observatory. E0102 is located about 190,000 light years away in the Small Magellanic Cloud, one of the nearest galaxies to the Milky Way. It was created when a star that was much more massive than the Sun exploded, an event that would have been visible from the Southern Hemisphere of the Earth over 1000 years ago. Chandra first observed E0102 shortly after its launch in 1999. New X-ray data have now been used to create this spectacular image and help celebrate the ten-year anniversary of Chandra's launch on July 23, 1999. In this latest image of E0102, the lowest-energy X-rays are colored orange, the intermediate range of X-rays is cyan, and the highest-energy X-rays Chandra detected are blue. An optical image from the Hubble Space Telescope (in red, green and blue) shows additional structure in the remnant and also reveals foreground stars in the field. 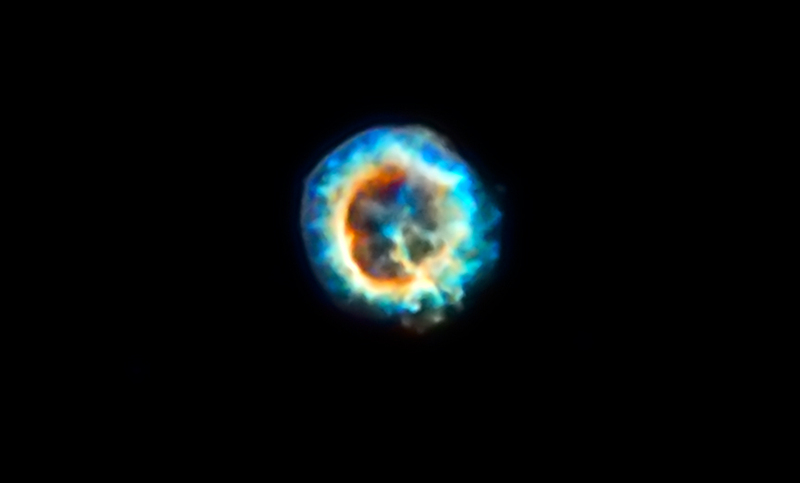 The Chandra image shows the outer blast wave produced by the supernova (blue), and an inner ring of cooler (red-orange) material. This inner ring is probably expanding ejecta from the explosion that is being heated by a shock wave traveling backwards into the ejecta. A massive star (not visible in this image) is illuminating the green cloud of gas and dust to the lower right of the image. 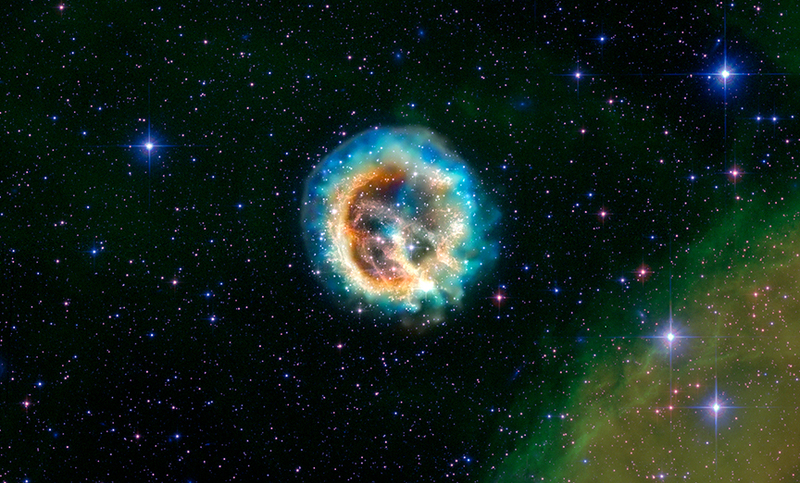 This star may have similar properties to the one that exploded to form E0102. Analysis of the Chandra spectrum gives astronomers new information about the geometry of the remnant, with implications for the nature of the explosion. The spectrum - which precisely separates X-rays of different energies - shows some material is moving away from Earth and some is moving toward us. When the material is moving away, its light is shifted toward the red end of the spectrum due to the so-called Doppler effect. Alternatively, when material is moving toward us, the light is bluer because of the same effect. 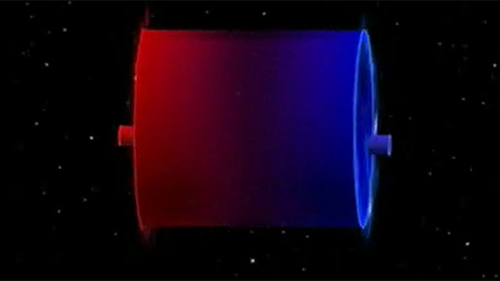 A clear separation was detected between the red-shifted and blue-shifted light, leading astronomers to think that the appearance of E0102 is best explained by a model in which the ejecta is shaped like a cylinder that is being viewed almost exactly end-on (see animation above). The smaller red and blue cylinders represent faster moving material closer to the cylinder axis. 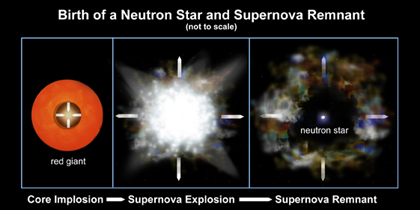 This model suggests that the explosion that created the E0102 remnant may itself have been strongly asymmetric, consistent with the rapid kicks given to neutron stars after supernova explosions. Another possibility is that the star exploded into a disk of material formed when material was shed from the equator of the pre-supernova red giant star. Such asymmetries have been observed in winds from lower mass red giants that form planetary nebulas. Coordinates (J2000) RA 01h 04m 1.50s | Dec -72° 01´ 55.7"